Our online store has the best selection and lowest prices on cool Jeep Keychains and Wrangler key accessories. Shop Jeep Keychains for all make and model Jeep Wrangler models and trims including the Unlimited, Rubicon, Sahara, Sport, Willys, JL, JLU, JK, JKU, LJ, TJ, YJ, CJ, Cj7, etc. Jeep Wrangler Key chain merchandise like escape tool key rings, keychains with flashlights, stainless steel keychains, trail rated key fobs, leather key chains, lanyard key rings, steering wheel keychains, Jeep logo key fobs, bottle opener key chains, Jeep grille keyrings, personalized replacement key rings, custom Jeep girl key holders, vintage grille key chains, key tag charms, and much more. Cover your Jeep key and choose from many different colors like Black, Brown, Red, Blue, Orange, Green, Pink, Yellow, Purple, Silver, etc. We have everything you need to show off your Jeep passion by throwing on a new Jeep key fob that is unique to your tastes. We have you covered when it comes to standing out from other Jeep owners by offering Jeep Wrangler key chains sure to set you apart from the rest at deals you won’t find anywhere else. 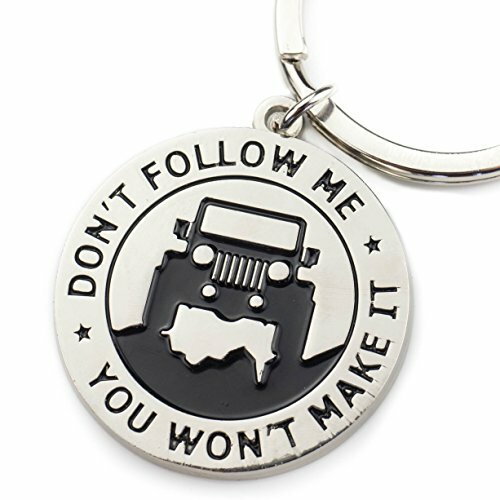 This is the perfect category to browse when picking out a Jeep keychain for yourself or as a gift for Jeep lovers. Most of the off-road Jeep keychains include free shipping too!